Burger King kicks up the quick-service burger category's value-menu "numbers game" another notch today with a new "5 for $4" deal. Burger King kicks up the quick-service burger category's value-menu "numbers game" another notch today with a new "5 for $4" deal. 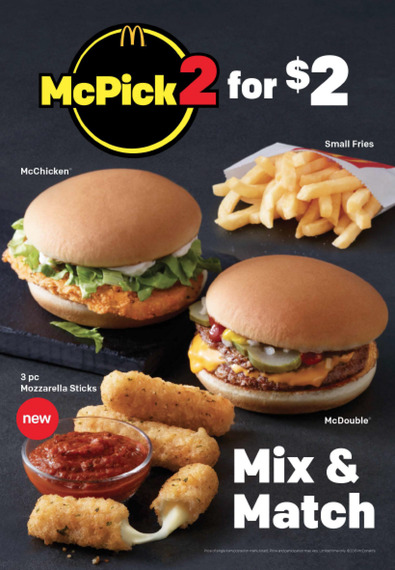 That takes on Wendy's "4 for $4" meal, McDonald's just-begun "McPick 2 for $2" and other burger chains' promotions targeting consumers who can't afford some of the new premium-price sandwiches being offered, such as Carl's Jr./Hardee's new $5.59 Steakhouse Thickburger. Burger King has been touting a "2 for $5" bundle with core entrees such as the recently launched Flame Grilled Chicken Burger LTO and core items such as the Big King burger, Original Chicken Sandwich and Big Fish. But this new deal offers diners five items for $4: Bacon Cheeseburger, small French Fries, small drink, 4-piece Chicken Nuggets or a warm chocolate chip cookie. 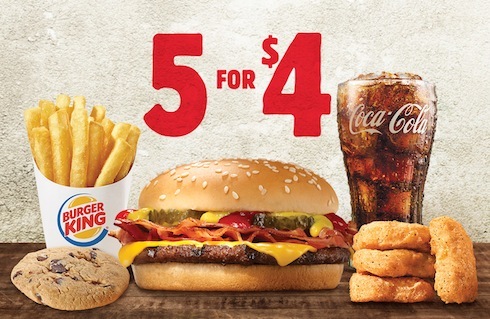 Burger King's new deal counters the "4 for $4" meal that Wendy's has offered since October 2015. That bundle includes a Jr. Bacon Cheeseburger, chicken nuggets, small fries and a small drink. During his Nov. 4, 2015, earnings call with analysts, Wendy's CEO Emil Brolick said the company was "very happy with the early results" from 4 for $4. McDonald's new "McPick" value menu, which officially launched today, offers diners their choice of two items from among the McDouble, McChicken, small fries and mozzarella sticks for $2. Some markets are also offering "2 for $5" menu packages. Checkers/Rally's is also in the game, offering a new "$2 Meal Deal." Diners have the choice of items from a list that includes the Checkerburger with Cheese, Spicy Chicken Sandwich, Crispy Fish Sandwich, Bacon Cheddar Crisp, chili dog and small seasoned fries. Even Carl's Jr./Hardee's are playing, despite those chains' traditional hostility to discounting. But their Sausage & Egg Biscuit is being offered at a "2 for $3.50" price. Jack in the Box hasn't yet joined the value-bundle parade. Instead, it has revived its $4.99 Chipotle Chicken Club combo deal. Why the rush to support the low end of the menu-price spectrum? Partly it's a balance to 2015's flood of higher priced burgers and entrees, which were an attempt to shore up local store profit margins. Now it's time to focus on the other end of the price dynamic for a while. But demographics as well as economics drive the trend. 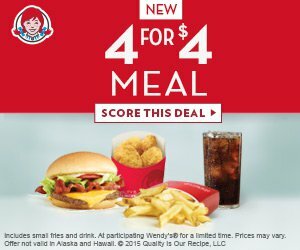 During his Aug. 5, 2015, earnings call, Wendy's Brolick hinted at the "4 for $4" meal bundle that was coming. Consumers are moving away from traditional value menus, he said. That's because "there are a lot of consumers out there who are simply heavy users of quick-serve restaurants, who don't have a lot of disposable income, and because they're using restaurants frequently, price/value is something that is important to them. And we see that as something that will be important for a long time to come, and we just have to evolve our offering to be more relevant to the specific needs that they have."